ARLINGTON -- Bill Moyers, a public television personality and a former deputy director of the Peace Corps, was arrested Saturday night on Route 7A and charged with driving under the influence of alcohol. "I intend to contest the charge," Moyers told the Banner in a faxed statement Thursday. Moyers served as deputy director of the Peace Corps under President John Kennedy and as President Lyndon B. Johnson's press secretary from 1965 to 1967. He is regarded as one of the most influential journalists in the U.S. for his work on PBS. Moyers told the Banner he had left a friend's birthday party around 10 p.m., just before his arrest Saturday. He admitted to the arresting officer he had drunk a glass of champagne and "a small amount of wine" at the party, Moyers wrote. Moyers swerved repeatedly across the centerline of the road and had trouble negotiating a curve, according to Trooper Travis Kline of the Vermont State Police. Kline said he pulled Moyers over a short distance south of the Route 313 intersection. "Not only was I observing the speed limit," Moyers wrote, "but my companions - my wife and two friends - testified they had detected no signs of any problem with my driving, and that I appeared to be in full control of my faculties, as indeed I was. I intend to contest the charges." Kline talked with Moyers during the ride to the Shaftsbury barracks, and learned that Moyers worked in television, but he was not aware of Moyers' fame in broadcasting, and Moyers didn't announce it, Kline said. After hearing about Moyers' career, Kline said, "We don't judge people. ... It doesn't matter if you're a movie star or a next-door neighbor. People make mistakes. It's human, I guess." A roadside breath test showed Moyers' blood-alcohol content to be .10. The legal limit is .08. A follow-up test at the barracks about 1 1/2 hours later showed Moyers' blood-alcohol content had dropped to .079 - within the legal limit. But police calculate how much alcohol would have left the driver's system in the time after the arrest and take that into account, Kline said. In his note to the Banner, Moyers acknowledged that the initial test showed him to be slightly over the legal limit. "I have been driving 52 years - since I was 16 years old - and have never had a major traffic violation," Moyers wrote. A resident of Bernardsville, N.J., Moyers, 68, told Kline he was staying at a small hotel in Manchester, Kline said. Following the arrest, Kline cited Moyers to appear at Vermont District Court in Bennington on Aug. 12, and released him from the barracks. 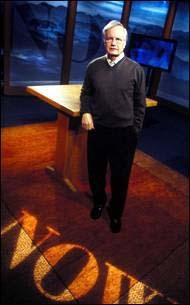 Since 1986, Moyers and his wife, Judith Davidson Moyers, have operated Public Affairs Television Inc., a company that has produced award-winning programs for PBS. Moyers is known for exploring social issues and religious topics. Moyers started his career in journalism at 16 as a cub reporter in Texas, his home state, according to the web site www.pbs.org. He studied religion and journalism in college, and moved to radio before becoming a special assistant to President Johnson. After leaving Washington, he went on to work as the publisher for Newsday. After leaving Newsday he worked for CBS and PBS.